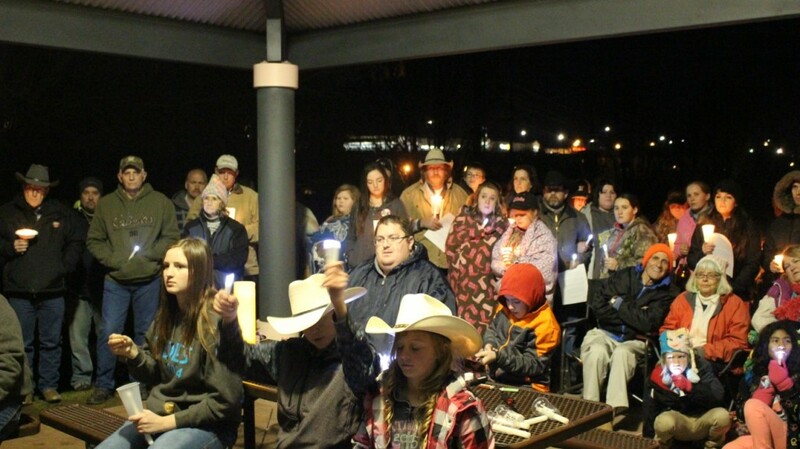 WASHINGTON CITY – Over 100 people gathered in Nisson Park in Washington City Monday night for a candlelight vigil to honor Arizona rancher Robert “LaVoy” Finicum who was killed last week during an encounter with federal and state law enforcement in Harney County, Oregon. 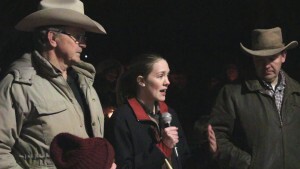 The vigil was planned by Charity Wight, who is friends with some of Finicum’s cousins. 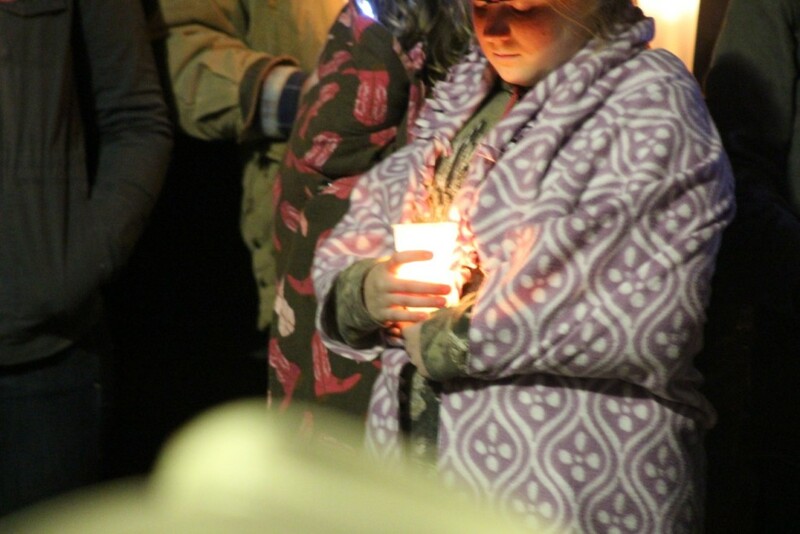 She wanted to do something to help the family know they’re supported by the community, Wight said, while also honoring Finicum’s memory. 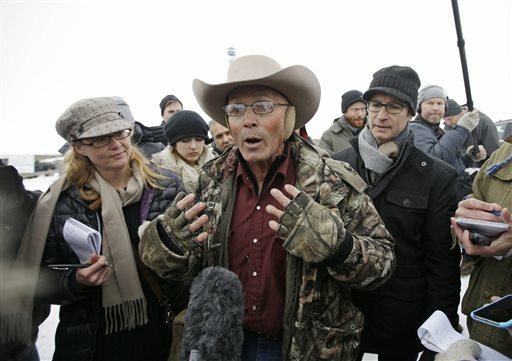 Finicum, 54, of Cane Beds, Arizona, was killed Jan. 26 after being fired upon by Oregon State Police in an operation involving the FBI. 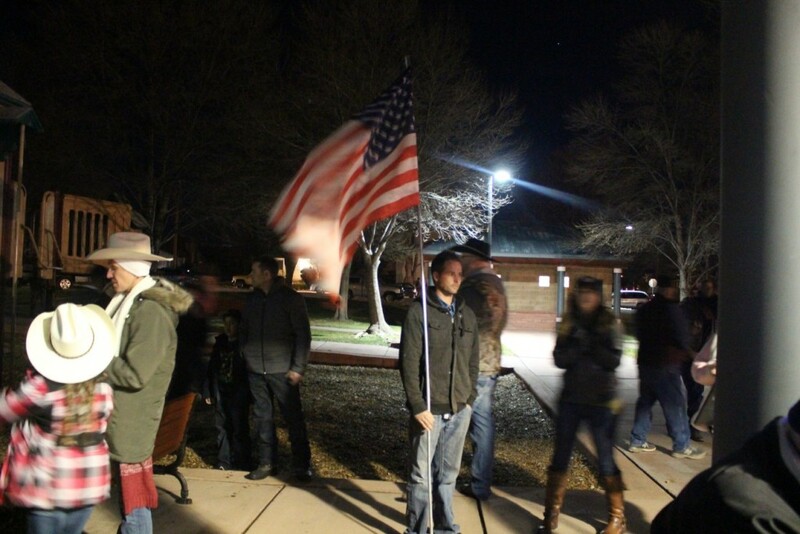 He, brothers Ammon and Ryan Bundy and others had taken over a building at the Malheur National Wildlife Refuge in Harney County, Oregon, following a protest of the imprisonment of ranchers Dwight and Steven Hammond. 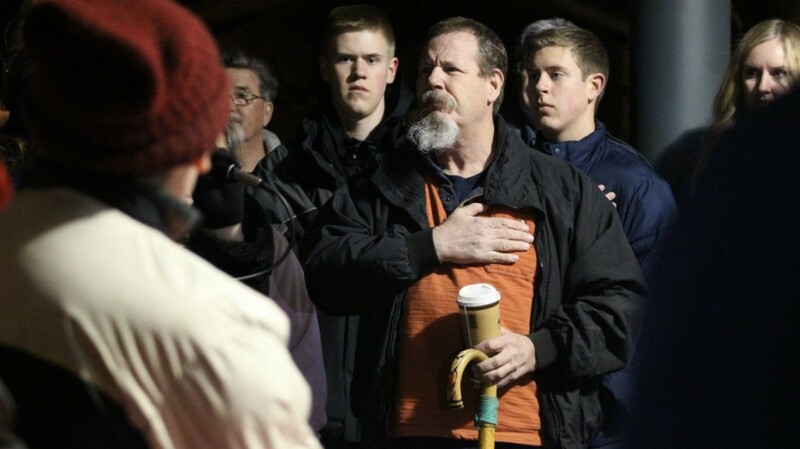 The occupation began Jan. 2 and was relatively peaceful until Jan. 26 when the FBI and Oregon State Police stopped a two-vehicle convoy on U.S. 395. The vehicle contained Finicum, the Bundys and others en route to talk to a group in another county. Aerial footage of the incident released by the FBI shows the truck Finicum was driving stop for a moment, then move again until encountering a roadblock. The truck then veered off the road and into a snowbank. The video shows Finicum getting out of the truck with his hands up for a moment then lowered to his side. Authorities have said Fincum was reaching for a gun and was subsequently shot by Oregon State Police. A 9 mm semi-automatic pistol was found in Finicum’s pocket after he was gunned down, the FBI said in a statement. 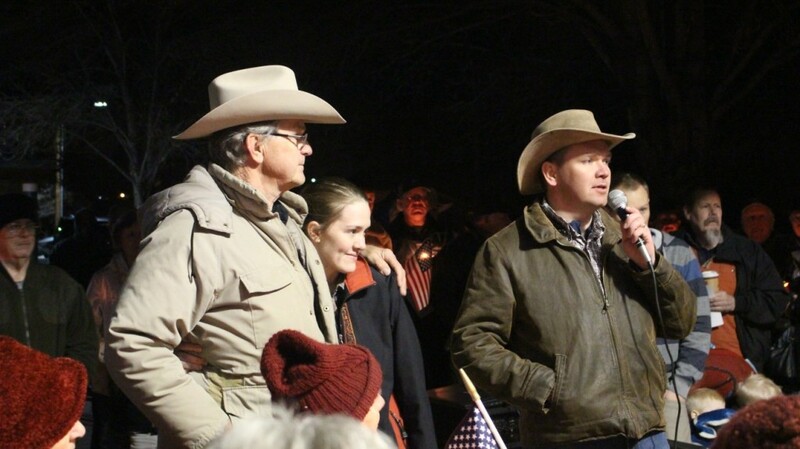 Finicum’s family and supporters have rejected that narrative. Family and supporters said Finicum was in Oregon to help educate people there about the Constitution and their constitutional rights. He believed the federal government is illegally holding onto public lands that should be under the possession and management of the states – and in doing so, he said, it is violating the Constitution. Moreover, he considered federal agencies, such as the Bureau of Land Management, to be monolithic, unaccountable bureaucracies that have no authority under the Constitution. Cluff said he remembers Finicum talking about his Constitutional studies. He remembers how much he learned during a family picnic. Finicum’s daughter urged others to do the same. 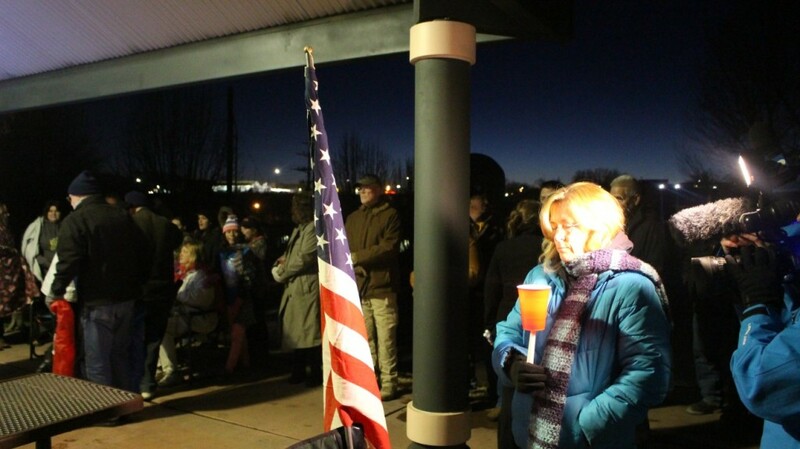 The family asked those attending Monday night’s vigil to continue Finicum’s mission of spreading constitutional awareness and education. They asked people not seek revenge or act out of anger over his death. 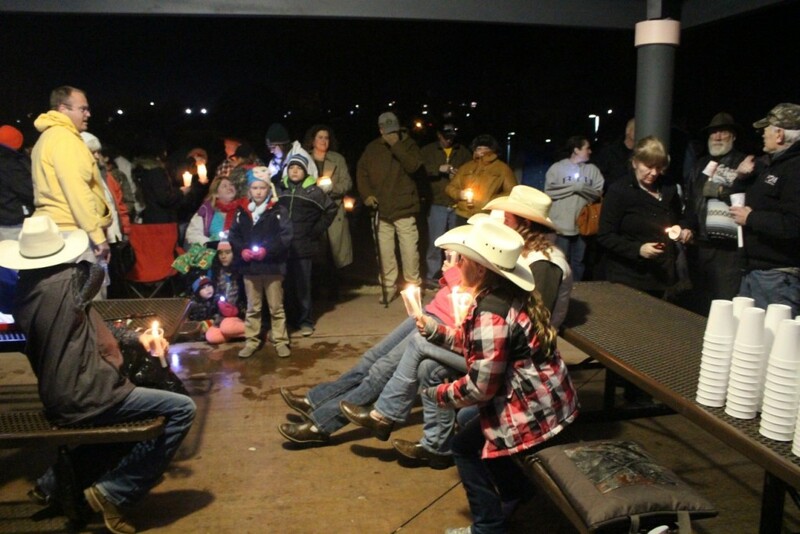 Cluff estimated that about 150 to 200 people arrived at the park to pay tribute to his cousin. 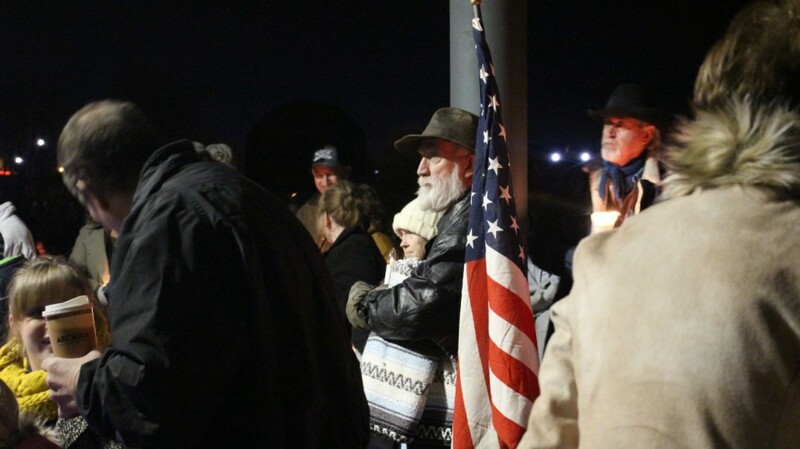 Many of them, like Wight, hadn’t known Finicum personally yet came to honor what he stood for, he said. 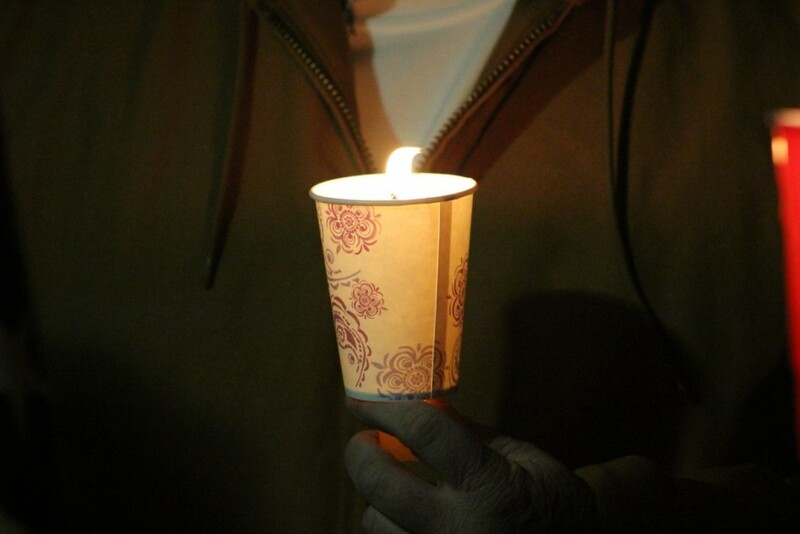 During the vigil, a moment of silence was held. Hats came off and heads were bowed as the time was taken to remember Finicum and the message his family said he was trying to spread. As the silence continued, a recording of bagpipes playing “Amazing Grace” began to fill the air. At its conclusion, so ended the observation of silence. 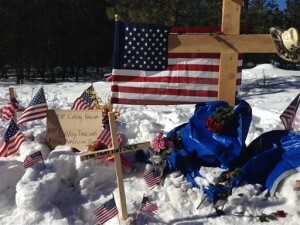 Funeral services for LaVoy Finicum will be held Friday at a chapel of The Church of Jesus Christ of Latter-day Saints located at 1436 S. McAllister Drive in Kanab. Visitation hours will be held from 11 a.m. to 2 p.m. The service will be held from 2:30-4 p.m.
Ok you Poor RANTERS, Go Ahead, Show Us Your Sign. OK, I’ll bite. 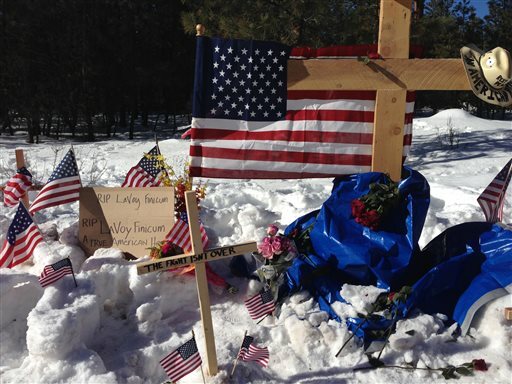 Lavoy Finicum was a common criminal who died a criminal’s death. Not a convicted anything. Big difference between alleged and convicted. Remember Mr. lawyer (want a be) that one is innocent until proven guilty. Might want to educate yourself on Judges like Mosman. He does not like smart-a-lick jokes, posts on facebook, or any social media that he feels is borderline. Some of you might take heed (3 musketeers). BUT he did release one today and will take couple days to decide on another. Another good job to the PD! Some officials in Burns are asking to have the FBI and State Troopers removed from their town – in writing and notarized. Good job! 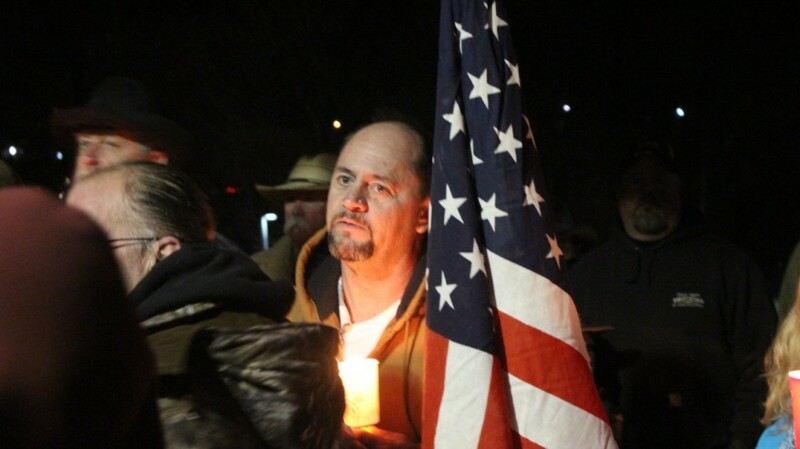 Looks like Finicum’s spirit will live on in the people, with grace and dignity. Well…written and notarized. Hoo doggy! That’ll show them smarty pants feds. This awk-you-pay-shun ain’t running on low octane. No sir-ee. Duane Kirkland – released, no charges. Kenneth Medenbach – charge – stolen Fed vehicle class C felony state, bail $10,000 – not in custody – was already facing fed charges when arrested and STILL RELEASED ON BAIL. Blaine Cooper aka Stanley Blaine Hicks, not in Portland or Deschutes. Neil Wampler -not in custody in Portland or Deschutes. Rest charged with Title 18 section 372 – carries up to 5 so according to 18USC subsection 3559 Class E Felony (one up from misdemeanor). Although started by lightning with BLM crews nearby (DOJ Release 10/7/15), the Hammonds were charged and BIFZ shows “man symbol”. Backfires are constantly set by USFS, BLM, CalFire (including con crews) and prescribed burns that have gotten out of the “control” zone, yet none have been criminally charged. WHERE IS THE ARSON INVESTIGATION REPORT FOR 2001 AND 2006??? 2001 – Pull the RCRC from Regional Archaeologist. Pull all consults w/FMO & State Historic Preservation Officer (neither reside at the Refuge). Appears from governmental records Malheur Refuge has no “permanent” resident. On average the Interagency does prescribed fire burns of 10,000 acres a year. No heavy equipment allowed due to protected resources, so was extremely logical for the Hammonds to set back-fires (inmates get to do it!) to save their livestock’s winter feed. Probably an agricultural law somewhere that pertains to protection of feed source as there is for protection of the livestock. According to OBP, the Cattlemen’s Association is involved in current negotiations of Hammond’s grazing rights and there’s pending appeal at Dept of Interior. 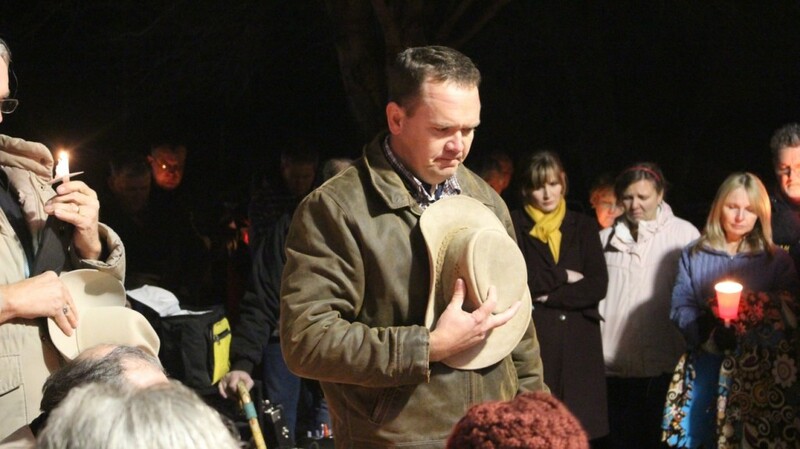 Therefore the Cattlemen’s Association must refrain from commenting – law 101 and common sense. According to John Sepulvedo & Amanda Peacher’s articled dated 1/23/2016 “The occupation is complicating those discussions”. The BLM doesn’t have a contract with Bundy. So the cows are “trespassing” at most on public lands. Therefore, no contract. The Interagency “reduce fire fuel programs” hire goats, livestock, etc to reduce the growth and suppress the fuels in wildland areas. Maybe truth be known, BLM owes Bundy for that service. Sagebrush, any time of “brush” is highly flammable and can turn into an uncontrollable situation where life and property are affected. Finicum was killed protecting our individual “freedoms” and constitutional rights for all citizens. Some just don’t operate as “robots”, some with an eagerness to know and learn the truth, seek it, find it, and passionately want to educate. My critters have more common sense than most humans. Here we go again. Observer spouts a bunch of disjointed assertions pretending to know something about the law. Everything you question has been adjudicated in numerous courts of law. Bundy has lost every time, most recently with a conservative Republican appointee ruling against each and every claim that Bundy has raised. Bundy and observer are clearly both idiots and losers. It is common for those who have achieved little in their worthless lives to blame government conspiracies for their lack of success. Chris: I’m so sorry that you have such anger in your words and in your heart. Facts are being presented and many men/women have been released years after serving hard time for being innocent. Seriously could care less about the political circus of clowns in any party. So throwing some of that my way does you no good. If the Treasury has a problem with any of us, they simply take it, no questions ask. Therefore, your arguments are just a moot point. Lastly you appear to dog me with “It is common for those who have achieved little in their worthless lives to blame government conspiracies for their lack of success.” To respond to your accusation: I don’t owe you an answer to my net worth but you are way far off, and your comments mean nothing to me. Success and worth is not based on paper, but rather in morals, integrity, truth and service to others. If money is the root of all evil, then one must look at everything in their lives regarding it, if they are to insure a peaceful existence on this planet. You done being silly? a) “extreme” is key. Won’t fly; to most Americans “extreme” civil unrest is “violent”. Killing President Kennedy and Martin Luther King Jr.. What would we call the killing of Finicum? b) Title 18 930(a) and more specific (h). Well (h) states a sign must be posted in a conspicuous place at each public entrance. (a) states fine and no more than 1 year in jail = misdemeanor. c) employee and volunteers are not Officers/officials under Title 18 372 and on Judge Aiken’s sons website, it states the headquarters as being empty and the government agencies state there is no permanent resident. Fish and Game site states in article with the rat that ” we can confirm that no federal staff were in the building at the time of the initial incident. ” http://www.fws.gov/refuge/malheur/ The regional office where an officer/official can be found is located at the Pacific Region in Portland. In the dead of winter, and i do believe the Judge’s sons that the headquarters were empty. d) section 9262.1 If convicted, one faces a fine of no more than $1000 and 1yr in jail = misdemeanor. e) Typical BS about “fear”. Had most of the visitors and staff known about the rats nesting in the building, how many would fear going inside? So if all the above carries misdemeanor convictions, the conspiracy card the prosecutors are hoping to bring into a felony, can’t legally fly, right Chris? If no felony was committed, conspiracy is a misdemeanor. So if it’s true that conspiracy is punished one or 2 degrees under; most that can be punished, if convicted, is misdemeanor – the lesser charge of a completed offense. You are so stupid, observer. 18 U.S. Code § 372 defines the conspiracy charged and categorizes it as a federal class D felony by virtue of the potential penalties. That is all that is necessary to understand the indictment. All of your contorted logic is completely irrelevant. He loved life so much he sacrificed himself in the name of nothing. These so called militia groups are just a parasite on our society. A guy that recently made his living taking in money from the government while refusing recognize the government; a guy who became a follower of a seditious traitor to his nation; a guy who directly disobeyed his church leaders while engaging in felonious behavior; a guy who brandished weapons as a threat to duly elected and appointed law enforcement; a guy who committed suicide by cop. This guy we honor with a candlelight vigil. I would like to thank St. George News for the fair and balanced covering of this event. 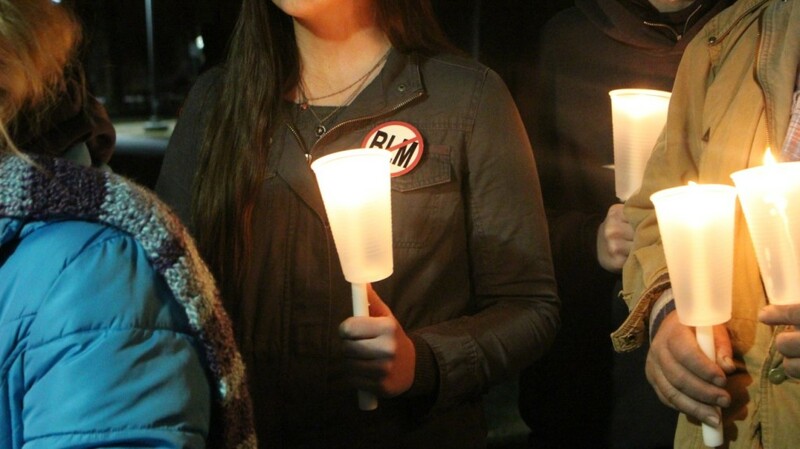 This was not a political rally, this was an evening for family and friends to honor the life of a good man. Before writing slanderous ugly comments about a good man, please do your homework, don’t be a lemming senselessly following a crowd without any thought of finding the truth. I challenge you to find one time outside of the last 45 minutes of this man’s life, to find any act of aggression. Then, we can debate if that was aggression at all. When the facts come out, I believe you will find a man with righteous indignation trying to protect all of our rights, including those who choose to attack and criticize him, with his very life. Those who choose to demonize the legal militias rising up surely would have been defending the crown against George Washington, all of the founding fathers and the “rowdy, undisciplined” Boston Tea Party. Many great men have given their lives so that you and I may have freedom and we have just witnessed in modern day what that takes. 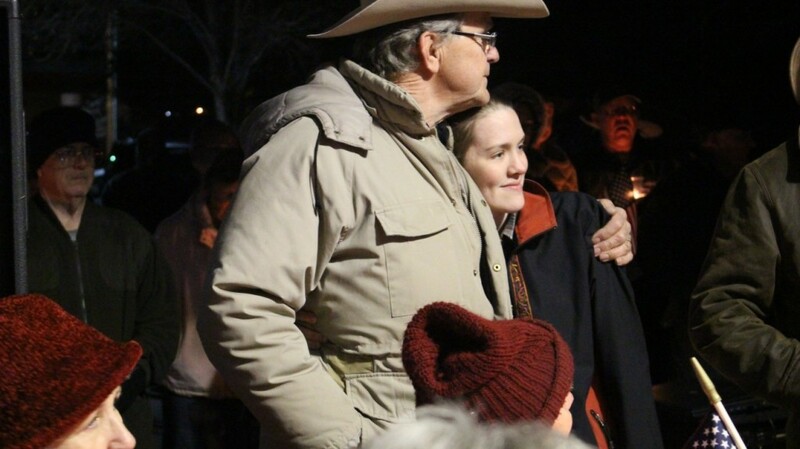 A man like LaVoy Finicum. Please do not let this man die in vain. Study out the issues before you jump off the cliff with the rest of the lemmings. Weather you like it or not he died for your freedom as well as mine. He got what he was asking for. Glad he is somebody’s hero, he’s not mine. doc0007 – Finicum actively promoted his criminal behavior and treasonous views in the media every chance he got in recent months. 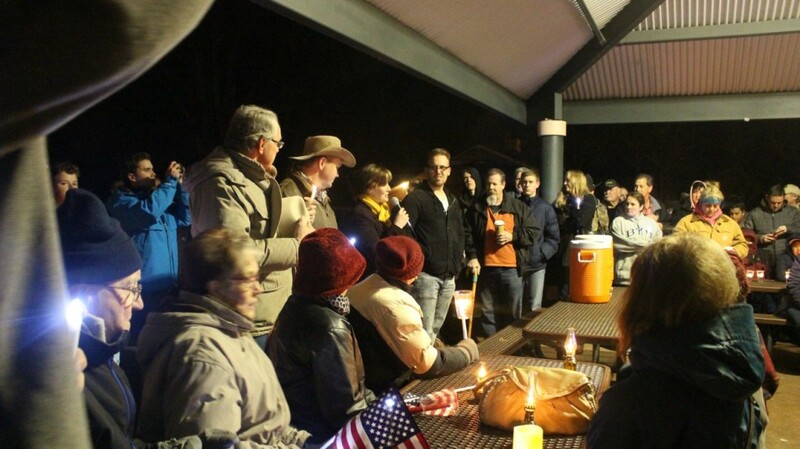 You don’t get to hold a vigil in a public park for this guy and then ask for reverence and respect. Your comparison of the Bundyites with the founding fathers reveals your ignorance. A more apt comparison is with the seditious southern states during the Civil War. Suicide is not a noble end. I like to think an apt comparison is the Whiskey Rebellion, arguably the first large scale revolt against federal rule, and one that was put down brutally by the very founding fathers that the Bundy’s revere. Rule of law versus vigilantism is the real struggle here, and even here on the Bundy home turf, the public stands firmly behind the law. Bender, could you please give me one exemple of LaVoy’s criminal behavior and his treasonous views. The time he and a group of terrorists took over a bird sanctuary costing hard working Americans millions and putting a few people out of work for over a month now. Oh and the time on Jan 26 when he tried to kill law enforcement officers trying to stop him from doing any more damage to America. This man was wrongfully killed for a cause he deeply believed in. He wanted to protect this great land for his posterity. He never harmed anyone and was not found guilty of anything. He left this world a better place than what he found it. Can any of you say the same about yourself? I am willing to bet that when the truth comes out… as it is, that not one of you cowards will be man or woman enough to admit you have wronged a good man and his family. I believe you will cower behind the screen of a computer or hide in your closets talking big, spewing venomous hateful lies thinking you are real smart. It takes a real man to admit when you were wrong and correct the damage you have caused. I know I am willing to do that if I am wrong. Are you? I guess we will see. What are YOU willing to die for? Anything? You’re absolutely right, it takes a real man to admit that he is wrong. So…. When are you going to do it? Lil rainbow is one of those hiding , thinks she knows something. NOT! This low life got exactly what he deserved ! Your Ill, Dot Dot Dot. Maybe you Need God. 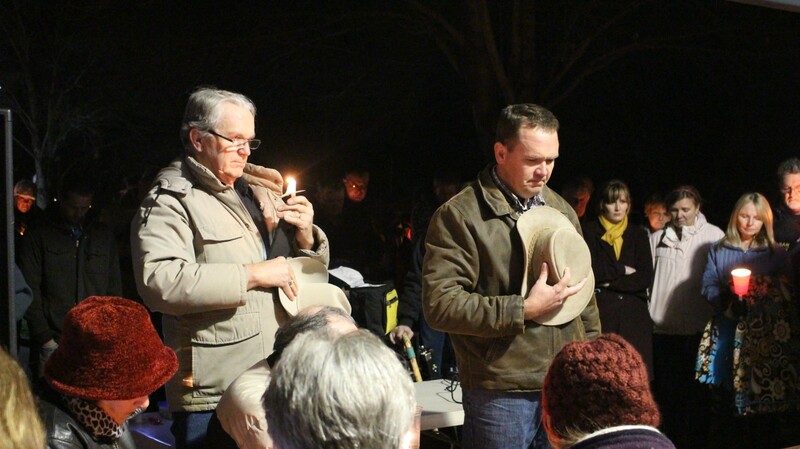 For LaVoy’s Family: The goodness will remain. 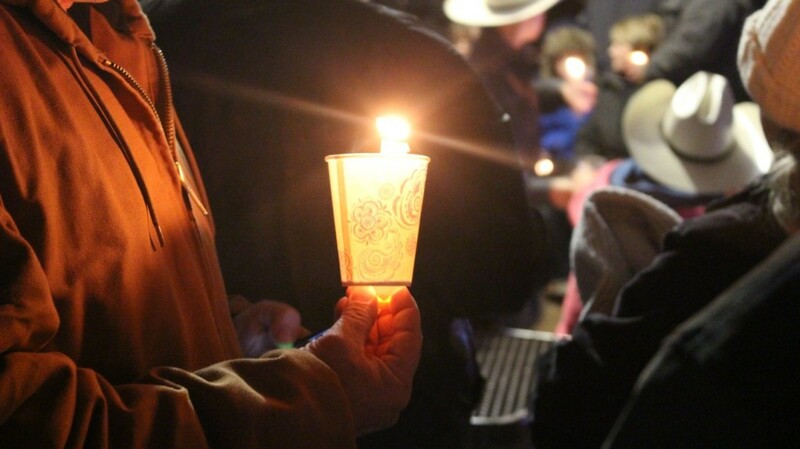 Those who knew LaVoy knew his heart: kind, gentle, caring and compassionate. God knows the truth. Let the goodness be the core of your strength. 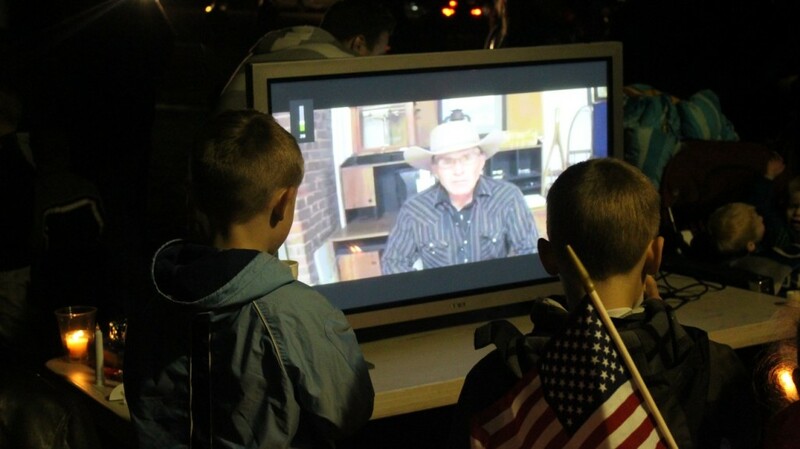 There is an evil in this land we call America: and One Cowboy Stood Up against it. in Oregon, and made a stand. Remember this: the evil that encompasses those who hate, vilify, lie, twist and distort the truth shall not remain. It is the goodness and truth that are eternal. There was a goodness in LaVoy. There was a gentleness and kindness. This is what will remain and stay with you. In the coming days, and months, and years, be comforted with the knowledge there will always be those who think of you. People do not forget. hear the quiet winds say: Walk on. For LaVoy is not gone, he is there in every blade of grass; in every sunset beyond the horizon. He is there in the antics of the spring calving, he is there is the frost of the morning. give you strength: to walk on. the glint of a living world shone forth from his belief. time will show LaVoy stood true. and we saw it in his eyes.